Organic Lemon EveryDay Detox is an herbal tea used to promote healthy liver function. * How Do I know it Works? The use of Organic Lemon EveryDay Detox for liver protection is based on the traditional European use of herbal teas made from burdock, stinging nettle and cleavers. * When Should I Use It? Unless directed otherwise by your healthcare practitioner, drink 2 cups daily, at least 30 minutes before or after meals. How Does it taste? Characteristic tastes of slightly bitter and slightly sweet, balanced with pleasantly aromatic citrus from lemon myrtle. Lemon EveryDay Detox responds to concerns of living in a toxic world by applying traditional European herbal wisdom with a tea that is designed to promote healthy liver function. * This blend of burdock, cleavers and nettles has been used for generations in Traditional European herbal formulas. In Great Britain this formula is traditionally used to "purify the blood and stimulate the removal of waste. 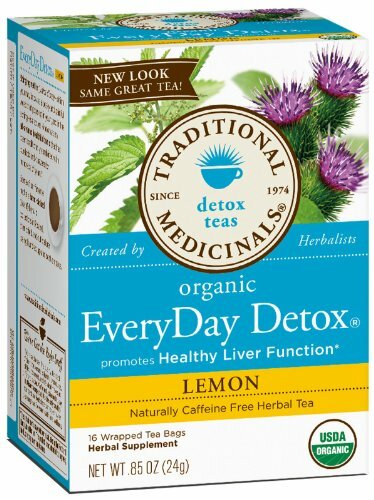 "* Traditional Medicinals team of herbalists has formulated Lemon EveryDay Detox to support your liver health*and ensure beneficial digestive activity* -this tea will be an enjoyable addition to everyday health.